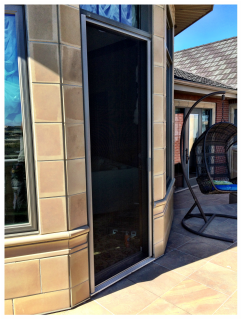 retractable screen door perfect for your home. Redeemed Homes retractable screen doors will help keep your family healthy and comfortable, and your home attractive. You will naturally cool your home by opening the doors and cut those rising energy bills in the process! Why our retractable screens? If you do a side by side comparison of our retractable screen door with any other brand retractable screen door, you will immediately see the QUALITY difference. A World of Screen Door ColorsTo help you keep up with the latest trends in home decorating, our Screen Systems carries retractable screen doors in dozens of the latest architectural color schemes. One of the key benefits of our retractable screen door color options is the ability to blend your new retractable screen with your home so that it is virtually unnoticeable. You can make certain of this when you buy a retractable screen door because whatever color you may be looking for or trying to match, Redeemed Homes Screen Systems has you covered. Exceeding Paint Industry StandardsOur retractable screen door color finishes are especially formulated to resist UV rays and salt spray, exceeding AAMA 2604 paint standards (one of the toughest standards in the paint industry). Exceeding these standards is essential in retractable screen door manufacturing in order to ensure that the paint properly adheres to all aluminum retractable screen door parts and that our screen door products live up to our Limited Lifetime Warranty. Seven (7) Standard Screen Door ColorsWhite and black retractable screen doors are the most popular but Mirage also carries standard colors in cream, wood, grey, and two shades of brown.